Full Service | Self Service | Intro to WuFoo Forms | What about Google Forms? 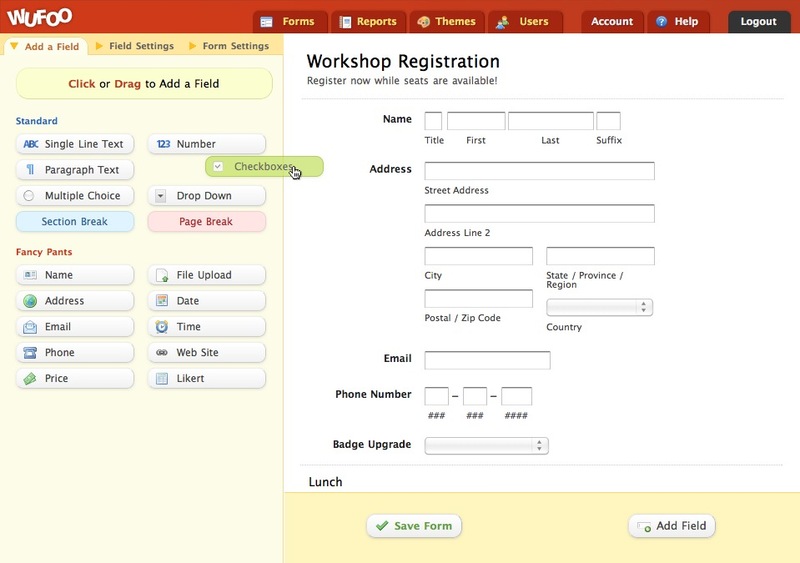 UCSC Web Services offers a web form creation service utilizing an easy to use online form builder called Wufoo. Official UCSC departments, divisions, and research sites are eligible to use the service. Building forms with WuFoo is very fast and easy. We offer two options. Web publishing services are available to official campus departments, units, groups, and organizations. We'll take form requests and account requests on a first come, first served basis and turnaround time will be based on demand. We will respond to requests within 2 business days and provide a time estimate. There is no cost for either the full service or self-service option. Feel free to visit WuFoo to sign up for a free Demo account. With the self-service option, we give you an account so you can create your own forms. Have the time and desire to learn the tool. Using Google forms is another option. If collaboration and sharing options or adding scripting of your own are important, Google Forms might be a better choice. If you are unsure, ask us - we can help you decide which will work better for you. Since Google updates their applications and interfaces all the time, we can't maintain an up-to-date and completely accurate list. With that disclaimer in mind, we've attempted a comparison below of some key similarities and differences (as of February 2019).